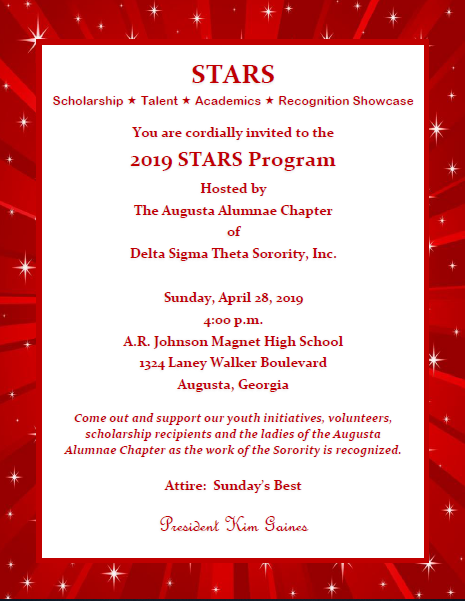 From humble beginnings to a stellar future, the Augusta Alumnae Chapter (AAC) of Delta Sigma Theta Sorority, Inc. has been a driving force in the community. The Augusta Alumnae Chapter initiated chartering procedures in January, 1978; Sorors Hertha Blount, Marie Johnson, and Mildred Brown were instrumental in researching and organizing these procedures. Prior to that time Augusta had been linked with the Aiken-Augusta Alumnae Chapter. 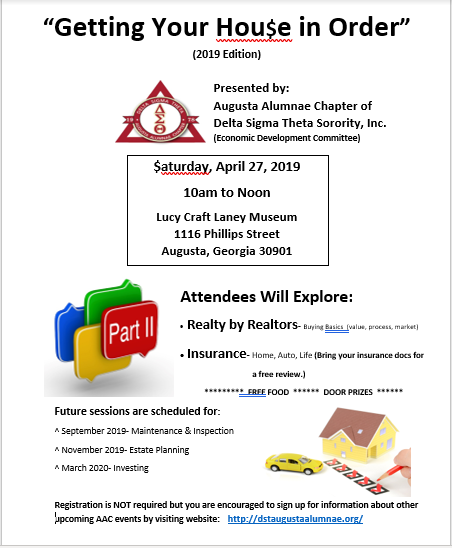 Although Aiken, South Carolina and Augusta, GA are neighboring cities, Aiken is in the South Atlantic Region and Augusta is in the Southern Region according to the districting guidelines of the National Headquarters of Delta Sigma Theta. On August 29, 1978, Soror National President, Thelma T. Daley notified Augusta sorors of their chapter status and officially welcomed them to the Southern Region. Officers for the newly formed chapter were installed on October 15, 1978 by the Southern Regional Director, Soror Kathleen Wright and Regional Representative, Soror Alexis Roberts. Soror Geneva Stallings served as the first President for the chapter. Thirty-three (33) sorors were recognized as charter members. The Augusta Alumnae Chapter used many locations such as the Shiloh Community Center to conduct business. As the chapter increased its membership and its community status, the need for a permanent meeting place became apparent. Under the aegis of Soror Dr. Verma Curtis, President of the Augusta Alumnae Chapter of Delta Sigma Theta Sorority, Inc. at that time, a search began. With keen insight from Sorors Margaret Beard Jones and George Lillian Bady Jenkins, in 1987 the sorority purchased the home of Louise Laney at 1116 Philips Street in Augusta, Georgia. Located in the inner city section of Augusta, the home was rich in history. It had suffered the hardships of a fire which engulfed the life of Soror Louise Laney, but the merits of the bountiful history outweighed the condition of the house. Lucy Craft Laney, the founder of Haines Normal and Industrial Institute, purchased the house originally. She became one of the nation’s leading African American educators and has been hailed nationally for the work she achieved at Haines. After the death, of Lucy Craft Laney, the house became the property of her niece, Soror Louise Laney. Gracious relatives from the state of Ohio sold the property to the Augusta Alumnae Chapter of Delta Sigma Theta Sorority, Inc. When the property was purchased, a non-profit corporation named The Delta House, Inc. was formed. Soror Theresa White was elected as the first President of the corporation which is now operated by an Executive Director, Soror Christine Betts and a Board of Directors comprised of persons from the local community and the Delta House, Inc. Restoration of the house and the addition of a conference center began under the leadership of Soror Gwendolyn Rountree. The project continued under the direction of Soror Presidents Annie Rogers and Christine Betts respectively. Under the leadership of Soror Christine Betts, the Lucy Craft Laney Museum of Black History opened in 1991. The facility serves as a meeting place to conduct Delta business, to house and display data and artifacts on the life of Lucy Craft Laney and other outstanding African Americans, to serve as a venue for community needs, and to expose the talents of gifted artists. The Augusta Alumnae Chapter of Delta Sigma Sorority, Inc. has been privileged to have Soror Dr. Louise Allen Rice among its ardent members. She has been a history maker for herself and for the chapter. Among her contributions to the sorority are: (1) becoming the first member of the Augusta Alumnae Chapter to serve as Regional Director for the Southern Region from 1989 to 1991; (2) becoming the first Augusta Alumnae member to serve as National Secretary from 1992 to 1996; (3) becoming the first member of the Augusta Alumnae Chapter to serve as National Chair of the Leadership Academy from 1996 to 2000; (4) becoming the first National 1st Vice President from 2000 to 2004; and (5) becoming the first member of the Augusta Alumnae Chapter to serve as National President of Delta Sigma Theta Sorority, Inc. from 2004 to the present. Augusta Alumnae supports and salutes this history maker and encourages other sorors to make the same achievements. In June, 2014 the Augusta Alumnae Chapter of Delta Sigma Theta Sorority, Inc. celebrated thirty-four (34) years of service to the community. As the chapter persists in meeting future challenges, visions, and dreams, the commitment to work in tandem with the needs of the community and the nation will continue.